Drones are slowly making their way into our modern lives. They can now deliver books, medical marijuana, or beer to sailors at sea. In the next few years, drones will dramatically change our lives. Farea al-Muslimi, a Yemeni youth activist, explains how they have already changed the social fabric of his country. [i] ‘May you die in a drone strike’ has now become people’s favourite curse, and when a parent wants a child to behave, he/she only needs to threaten to ‘call the drones,’ and the child will comply with any request. In the Global North, drones bring modernity to your doorstep. In Yemen, they deliver death. The exact number of drone strikes in Yemen cannot be fully ascertained, due to the covert nature of US operations in the region. While the first strike was carried out in 2002, all others have taken place after President Obama took office in 2009. 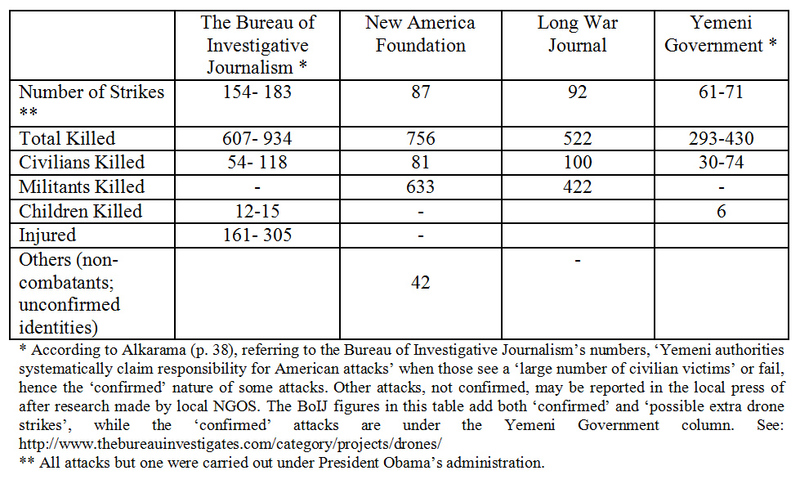 The table below summarises the data collected by the Bureau of Investigative Journalism, New America Foundation, the Long War Journal and the Government of Yemen on drone strikes in the country. These criteria raise many questions. First, if anyone can potentially be targeted, how effective can the strikes be in relation to weakening AQAP in the region? Moreover, are the conditions highlighted by Barack Obama ever being met? Several attacks come to mind, some of them involving drones, others both drones and missiles sent from US Navy ships. The first one is that of al Majaala, on December 17th 2009, portrayed in Jeremy Scahill’s 2013 documentary Dirty Wars. [vii] The target of this attack was Mohammed al-Qazimi, a former alleged al-Qaeda associate who had spent five years in a Yemeni jail, and had been released shortly before the strike. Since he had returned to Maajala, he had been passing by an army checkpoint morning and afternoon to go and buy his daily bread and khat. [viii] He could easily have been arrested and tried at any time for any crimes he was accused of. Did he represent a known threat to the Yemeni government? It is unlikely that he would have ever been released from prison if he did. Fifty-five people died on that day, including 14 women, seven of which were pregnant, and 21 children. [ix] A second attack of interest is that of Qawlan, on January 23rd 2013. [x] On that day, a known opponent of former President Ali Abdullah Saleh, Rabieh Hamud Labieh, was travelling by car. Labieh was a democratically elected local councillor who had turned against former President Saleh during the 2011 Arab Spring-related demonstrations. Labieh was notorious for having denounced the smuggling of government weapons between Sana’a and Saleh’s countryside stronghold right after his demise. He had been an opponent to the new regime, arguing that the country was still a dictatorship. Once again, why should he be targeted by the US government, except to contribute to a Yemeni government purge? Eight people died on that day, all civilians with no connections to AQAP. Drone strikes and targeted killings in Yemen are a very complex affair, much more so than the US government would like to admit. All parties involved, except the local population, seem to be benefiting from them. Ali Barman recalls the funeral of the Al-Maajala victims with emotion, especially an old lady who pleaded, referring to the US: ‘They even have laws that protect animals, why can’t they just consider us like their animals?’ Drones and the protection of animals in the US are two great signs of progress. 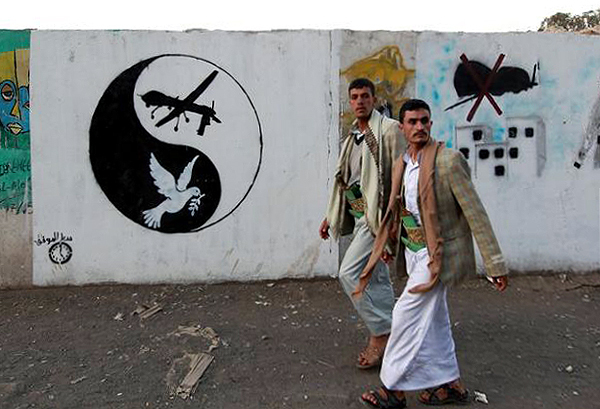 In Yemen, they bear a sinister meaning. If the drone program continues in Yemen, the support from the population towards AQAP is likely to become much stronger, this due to the fact that many more civilians die in strikes than AQAP operatives, and that when AQAP members are targeted and killed, there are many candidates to replace them, often being more radical than their predecessors. Since it is public knowledge that the Yemeni government provides its US ally with the necessary intelligence before a strike, popular support can only go one way, that of AQAP. Dr. Victoria Fontan is an MPhil Candidate in the Department of War Studies at King’s College London. She carried out research on drone strikes in Yemen in January 2014. This article is based on a series of stories published on her blog, which can be found at www.victoriacfontan.com. In July 2014, with some families of drone victims, she will contribute to the establishment of a network aimed at the systematic compilation of evidence after new strikes. [i] Interview with Farea Al-Muslimi, Sana’a, Yemen, January 7th 2014. [viii]Khat is a locally grown leaf that is chewed daily for its stimulant properties. [x] Interview with Mohammed al-Qawli, Qawlan, Yemen, January 8th 2014. [xi] Interview with Abdul Rahman Ali Barman, Sana’a, Yemen, January 9th 2014. [xiii] The author has recently initiated a research on the issue of moderate al-Qaeda affiliates in Fallujah, Iraq. For preliminary results, see: V. Fontan, ‘Out beyond Occupy Fallujah and the Islamic State in Iraq and Sham, there was a field’, in Harmonie Toros & Yannis Tellidis (eds. ), Researching Terrorism, Peace and Conflict Studies: Interaction, Synthesis and Opposition (Routledge, forthcoming in August 2014).